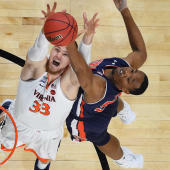 MARTIN, Tenn. (AP) Josiah Wallace hit a 3-pointer with 13 seconds left to lift Eastern Illinois to a 66-64 Ohio Valley Conference victory over UT Martin on Thursday night. The loss is the ninth straight for UT Martin (5-13), which is now 0-7 in conference play. Kevin Little hit a 3 with 4:49 left to put UT Martin in front, 60-58, and Delfincko Bogan added another to push it to 63-58, but the Skyhawks could not manage another field goal the rest of the way. Wallace scored at the basket, then hit a 3 with 1:40 remaining to tie the game at 63-63. Quintin Dove hit the second of two free throws with :31 left to put UT Martin in front. Wallace, who had 27 points in a win over conference co-leader Austin Peay on Saturday, finished with 17 points for Eastern Illinois (12-8, 5-2). Mack Smith added 14 points. Little finished with 16 points for UT Martin.